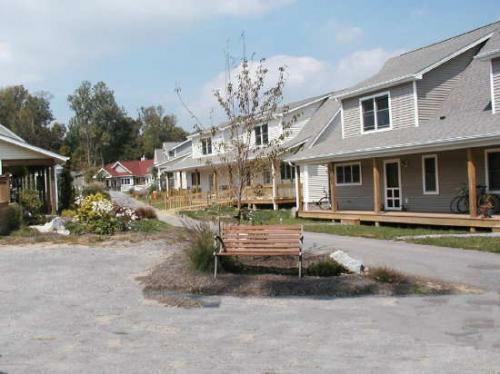 We are a cohousing community of 33 households, located on 33 acres in a beautiful natural setting in the town of Blacksburg, in the mountains of southwest Virginia on a ridge between the Blue Ridge and the Appalachians. Most members moved in during 2002-2004, with complete buildout in 2005. Our Common House is built. We include families with young children and/or teenage children, couples, and singles. Membership has been by self-selection. • working to create and maintain creative and positive relationships through consensus decision making, open dialogue, and creative conflict resolution. In addition to our own 17 acres of undisturbed woods, we're adjacent to a 169-acre park that is an old farmstead, and we're near a walking/biking trail into a national forest. As we develop our policies, guidelines, and norms, we strive for mutually respectful ways towards consensus, and we also remember to have fun and enjoy the rewards of living in community.